The Fate franchise is built entirely around legendary heroes fighting it out for the Holy Grail. And the newest game in the series, Fate/Grand Order gives anime makeovers to more of the greatest figures from myth and history than ever before. Below is a gallery of all the new heroes included in the mobile title Fate/Grand Order. Of course, many old favorites return as well, but this gallery is for those making their Fate series debut. Artemis — The Greek goddess of the hunt. Charles-Henri Sanson — High Executioner of the First French Republic. Jing Ke — Failed to assassinate the man who would one day become China’s first Emperor. Mata Hari — Exotic dancer, courtesan, and spy for Germany in World War I. The Phantom of the Opera — The titular character of the well-known Gothic novel. Asterios — The Minotaur of myth and legend. Caligula — The brutal Roman Emperor. Darius III — The Persian King who battled Alexander the Great. Eric Bloodaxe — An ancient king of Norway. Kiyohime — A spurned woman who became a dragon. Leonardo da Vinci — The original Renaissance man. Mephistopheles — The trickster Devil in Faust. 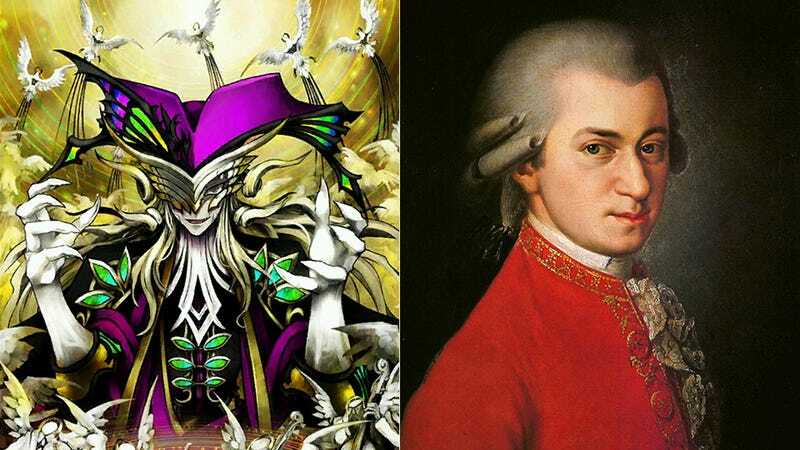 Wolfgang Amadeus Mozart — The brilliant classical composer. Zhuge Liang — One of China’s greatest strategists. Musashibo Benkei — A warrior monk known for great strength and loyalty. Leonidas — Spartan king known for fighting in the shade and dining in Hell. Romulus — Founder of Rome. Blackbeard — The most famous pirate ever to sail the seven seas. Boudica — The warrior queen who tried to drive the Romans out of Britain. Saint George — Slayer of Dragons. Marie Antoinette — The last queen of France. Saint Martha — Tamer of Dragons. Ushiwakamaru — One of the greatest samurai warriors of all time. Attila the Hun — Conqueror of much of ancient Europe. Also, owner of a wicked multi-colored lightsaber. Gaius Julius Caesar — First Emperor of Rome. Le Chevalier D’Eon — A French spy who passed for both a woman and a man. Sir Galahad — Knight of the Round Table and finder of the Holy Grail—and currently merged with Mashu Kyrielite. Fate/Grand Order was released for iOS and Android on July 29, 2015. There is currently no word on a Western release.